A few months ago I wrote a short text which keeps returning in my mind today as the initiator of a whole new strand in my writing, and which emerged out of an exhilarating frequentation of rhythms through listening rather than any rational outlines or plans. I’m not sure I can recall how it started other than the need to respond to the rhythms of a song while avoiding long-winded digressions on what that song was about. The text embodies my recurring preoccupation with arrangements, frames and breaking into frames; it is part of my ongoing concern with ‘writing sound’ as presence instead of ‘writing about sound’ as reference — or I should say in this case: writing rhythm, writing breath. The more I return to it the more I feel it needs to be read aloud and in a way that would make the reader breathless. 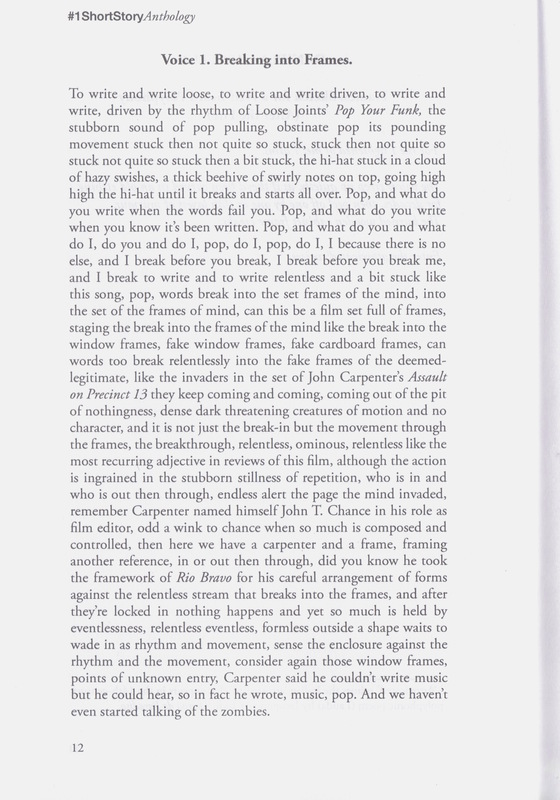 It has generated a number of similar texts, all of them constructed by cross-fading two prompts: in the first of the series it was Loose Joints’ disjointed song Pop Your Funk and a specific sequence in John Carpenter’s film Assault on Precinct 13; in another, for the sake and for the fun of sheer assonance, Breton’s Nadja and Twin Peaks’ Nadine (the one obsessed with silent curtain runners). And more.